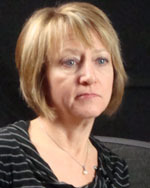 Carole Tarrant joined The Roanoke Times in 2005 and became editor in 2007. During her tenure, the paper and its website, roanoke.com, have won a number of national awards for photojournalism, breaking news, enterprise and multimedia reporting. The Scripps Howard Foundation, Pictures of the Year International, Editor & Publisher magazine and the Online News Association are among the organizations recognizing this work. Tarrant is on the national board of the Associated Press Managing Editors and a member of the Journalism and Women Symposium (JAWS). A Philadelphia native, she previously worked at newspapers in North Dakota, Florida and Alabama. She lives in Salem and is mother to a 9-year-old son. Carole Tarrant remembers the day tragedy struck at Virginia Tech, and during that fateful week, she tried to make certain the 33 victims who lost their lives were remembered and mourned by the community.